9+ Cryptocurrency and Bitcoin Discord - Cryptolinks - The World's Best Cryptocurrency Sites List! How about a platform where different users of cryptocurrencies are connected together to enjoy the benefits of sharing information? It involves the use of an application which has been designed with voice and text chat features called Discord. Crypto Discord is one group on Discord and is very simple on the mode of operation. Discord ensures that it has a clear voice for people who would love to use the platform and ensures a multiple server with channel support and other mobile applications. Crypto Discord takes all aspect of Blockchain and cryptocurrencies and since it is an app, you would have to download it on your mobile device. 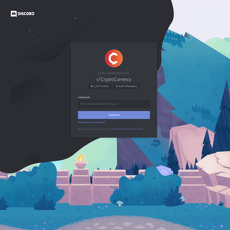 On the web page of Crypto Discord, all you have to do is click on Accept Invite and you can get started already. The acceptance of invite signifies the permission granted to join a group that talks about Blockchain. On site, you are shown the number of people registered on the group on the platform as well as the number of active people online. Discord application can be downloaded on different platforms like Google Play Store and it is known to have a 4.5-star rating, which shows how useful it is. Therefore, things just got better with cryptocurrencies being the talk of the category. There are other several categories and you could get a Tutorial video for Beginners of the Discord App. Discord App is accessible on both mobile devices and PC/MAC, so you could use them from anywhere in the world. All these 9 listed above have a way of contributing to improve users’ knowledge. You may not be able to use the Discord App without the application itself; hence, you would have to download first before being accessible to it. Invites are either sent by the platform or the creator of the group with his or name displayed boldly. All Crypto Discords above have the same design of website and application; simple, solid with great design. They make sure they are compatible with the mobile device being used to access them and make sure they are audible enough to be heard via the voice and text chat. As long as you have the application installed on your mobile device either from Google Play Store or anywhere else, all invites are accepted immediately. These invites give you access to the platform and ensure you get unlimited information about a type of Blockchain. With regard to how you perceive a Discord group, you can share with family and friends who will be interested in the group because of made-easy features like instant acceptance of invites. The Discord App was originally created for gamers, however, after much consideration on the type of features it possesses, it looked suitable for crypto users as well. The Voice and Text chat features will enhance dissemination of information easily to people and allow them take actions where necessary. Also, since it is an application for gamers, there are ways you can use cryptocurrencies to gamble or play games, this in turn makes cryptocurrency useful for gamers as well as for the platform. The voice and text chat communication becomes effective and guides you in making some decisions. You can join voice channels and chat with your group, enjoy real-time messaging by sharing video, images and text in rich chat as well as send one-to-one private messages. Generally, groups and channels belong in the same category because they are the part of the platform where users join. For example, Crypto Discord is a channel on Discord App with groups such as Rubix, Espers, etc. all to provide information for people. You can leave the group if you are no more interested or find nothing fancy in it. There is an option for it, so you wouldn’t feel like you have totally subscribed to the channel with no means of backing out. In this channel, you can join more than one group. Discord App is the latest form of communication which is user-friendly and has several features to aid easy usage. Features like Voice and text chat are different because not most applications will offer both at your beck-and-call. The voice is crystal clear and acceptance of invite is very easy. In conclusion, download the app first and consider the pros and cons which have been listed in the review of these groups before you proceed to accept an invite.